The Cascadia Cup sets the stage for a magical mini tournament in the best soccer region in North America: The Pacific Northwest. The teams are the Portland Timbers, Vancouver Whitecaps and Seattle Sounders, and the best attendance records in the league. The FutbolUSA desk was granted the opportunity to watch the match at Jeld-Wen field and the teams did not disappoint. True, as local Timbers followers, the 1-1 final score wasn't the best. But it was the experience that counted. Today the skies were clear to begin the match and the pitch was a deep, bright green that some in our company thought was artificial grass. Nope, the real thing. The crowds of the Northwest are exemplified by the boisterous Timbers Army and the small band of Vancouver followers. The ride on the MAX was full of chants from supporters of both clubs. The General Attendance sector--Timbers Army territory--never quieted down, relented or were subdued by the weather or Vancouver's tying goal. John Spencer was quoted as saying his team had played some of the best football this season, and the Scott is correct. It was a fast-paced game and very vertical at times with overlaps between Alexander, Chara, Alhassan and Nagbe. The goal was a justification of 13 shots on frame, and as the ball went in we all cheered in unison. Among our company were first-time spectators of the sport, and they yelled along with the rest of us for uncalled penalties, opening goals and the disillusionment of the opposing side's score. 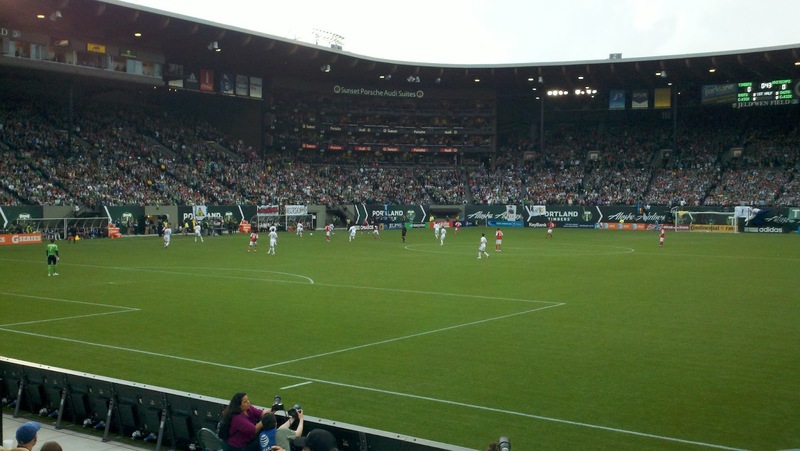 The Portland Timbers have a long way to go this season if they aim to make the playoffs. Last year they were close due to impeccable home form. They have lost a couple here and it hurts more when they are unable to earn wins away. The Nagbe-Boyd tandem works great and the verticality and passing is also there. A couple of missing pieces in the back line due to injury and suspension derailed what could have been another 3 points in a 4-game unbeaten streak. Let's stress the unbeaten... they have to win, not tie if they want to make it far in the tournament. Until then and beyond them we shall keep on cheering and singing along "when I root I root for the Timbers!" All true. Lighting, rain, great company and soccer. Go Timbers.